Night After Night: Raging, melting, burning. The activities that opened my week have strangely echoed those of the weekend past, completely without premeditation. Last Saturday, I caught Robert Wilson's Peer Gynt, followed on Sunday by a Handel work, Solomon, and a jazz set by the Billy Hart Quartet. Monday night was Wilson's Lohengrin; tonight, I caught Handel's Acis and Galatea at New York City Opera, then went down to the Bowery Poetry Club for Darcy James Argue's Secret Society. Strange. Handel's Acis and Galatea, an English-language pastorale unveiled in 1719, is a short, charming gloss on themes from Ovid's Metamorphoses, with a libretto by John Gay, Alexander Pope and John Hughes. To call it slight in comparison to his best known operas is no insult but simply fact; still, it contains some lovely music for soloists and chorus, accompanied by lithe, picturesque music. Mark Lamos's production sets the action, such as it is, as an airy countryside frolic; the chorus dances merrily and tosses large, inflated balls around the stage, while Galatea rocks back and forth on a swing suspended from the rafters. A massive Cupid figure reclines on a hillside behind them. Galatea sings of her love for the shepherd Acis; after being warned by Damon, a curiously fond bystander, not to rush off in pursuit of passion, Acis, in turn, sings of his devotion to Galatea. The chorus returns and everyone sings about how happy they all are. Curtain. When we return to the action, the chorus warns that happiness is fleeting, because the giant monster Polyphemus also has plans for Galatea. The monster descends in what looks like a giant action-figure box, in which a reduced version of the stage set implies his titanic height, and a baleful red beam on his helmet stands in for his single eye. Polyphemus busts a few dance moves picked up from Michael Jackson and Culture Club videos, then makes a pass at Galatea, which is summarily rejected. Damon shows up to provide the monster with tips on how he might more successfully woo the maiden. Acis decides to do battle with Polyphemus; Damon tries to convince him not to be so hasty. Galatea stumbles upon a Damon-enwrapped Acis, and sets out to convince her lover's protector that she's worthy of Acis's trust and love. Polyphemus spies the happy couple and goes nuts, crushing Acis with a boulder. Galatea mourns Acis, then summons her magical powers to transform him into a bubbling stream. The chorus advises Galatea not to grieve too long, and everyone takes a dip in Acis -- several men stripping their shirts off to do so. Curtain. I can't be the only one who wondered whether Damon -- always lurking, and intensely physical in his demonstrations of care for Acis -- might not have had some hidden agenda. After all, if he can find a way to hook up Polyphemus and Galatea, well, that does free up Acis. Brokeback Hillock, perhaps? Whatever you make of the piece and production, there was no mistaking the valor of tonight's performance. Sarah Jane McMahon was a bright, bubbly Galatea. Philippe Castagner, depite Paul Kellogg's pre-curtain announcement that the tenor was still under the weather (as Bernard Holland reported of the Sunday-afternoon opening), sang strongly and beautifully throughout the night as Acis. Nicholas Phan, as Damon, was clear and eager, and Jason Hardy, the Polyphemus, maintained a handsome sound despite challenges of music and choreography. Conductor Ransom Wilson led a perky reading, with especially fine contributions from his recorder players and continuo. Later on, downtown, Darcy James Argue's Secret Society opened to the sound of drummer Jon Wikan's new, improved electric cajon, now even spacier. His phase-shifting beat propelled the wiggly guitar figures, rounded clarinets and muted brass that open Argue's "Phobos." Sam Sadigursky blew a passionate solo over a rhythm section that has become scarily good; the climax captured the cinematic sweep of Pat Metheny and Lyle Mays, all sunburst, breeze and melting joy. Argue described "Transit" as a piece that uses the Fung Wah bus -- that cut-rate Chinatown line beloved of East Coast students and vagrants -- as "a metaphor for change." Static rhythms and long-lined melodies do indeed convey a sense of motionless motion...of sitting in one place for a long time, yet ending up somewhere other than where you began. Trumpeter Ingrid Jensen provided a solo exciting in its development: muted and slurred at its opening, racing and bold at its climax. "Lizard Brain" conjured some large, unwieldy beast trying to sing a delicate aria, then raging in frustration at its failiure. (Polyphemus?) Baritone saxophonist Josh Sinton blew up a storm over a lurching 13/8 funk beat. "Chrysalis" opened with wind and brass sections playing gently falling lines, like leaves falling from trees; its theme, reminiscent of "Unchained Melody," provided a showcase for Erica vonKleist's breathy flute and supple soprano saxophone. 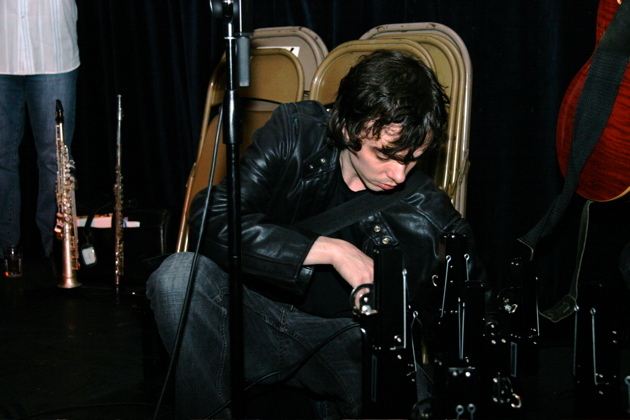 "Ritual," a deconstruction of British cult soul singer Lewis Taylor's "Lucky," featured a fervent solo by trombonist Alan Ferber, backed by guitarist Sebastian Noelle's slicing chords; during his own spot, Noelle played a few desultory notes, then used a cassette recorder to play a soul vocalist's voice into his guitar pickup for further distortion, and closed with a flurry of weirdly harmonized chords. A new chart unveiled tonight, "Induction Effect," played with the rhythmic clash of pitting five against four; long tones in the horn section hung suspended over busy ostinatos from the rhythm players. (Occasionally, I imagined a ghost vibraphonist, which made me think of Tortoise.) The band backed trumpeter André Canniere's solo with rolling, tumbling rhythms; a regal prog-rock climax led to a conclusion of busy little rhythmic conversations. Two of the band's signature tunes followed -- somehow, it doesn't feel too early to make that claim. Alto saxophonist Rob Wilkerson sighed and wailed over the writhing pulse permutations of "Flux in a Box," to which pianist Mike Holober responded with an altogether cooler soliloquy. Donny McCaslin played the cruelly high figures that open "Desolation Sound" over throbbing, Steve Reich-like pulsations in 7/8; brass stabs in the central section of the piece might have been borrowed from Stravinsky or a metal band, take your pick. Citing the notoriously fawning recent profile of classical pianist Condoleezza Rice in The New York Times, Argue suggested she might play "The Perils of Empire," tonight's closing number, "in a fall-out shelter after we nuke Iran." Opening with surly growls and sneering trumpets, the tune finally coalesced with a drunken waltz in the wind section; ironically, the songful melody might well have been borrowed from one of Disney's classic musicals. Wikan did his level best to derail it with his out-of-time stammers. I hadn't heard this piece performed live before, and didn't remember the versions I'd downloaded from Argue's blog being quite this unhinged and macabre -- a sign of the times, I suppose. Every time his players finished a number, Argue wore what looked like a slightly incredulous smile, as if the bandleader couldn't quite believe what he'd gotten away with. This I could understand: Argue's charts are smart and tuneful, tough on players, and incredibly gracious to listeners. And some bright publisher should be pushing his compositions to college jazz bands -- hard. I know I'd have killed to play music like this. Thanks again, Steve. The audio from this gig is now available on the Secret Society blog. Thank you so much for the wonderful synopsis of "Acis and Galathea". The program notes didn't have one. I quoted it (if you don't mind) in my "blogging" about the opera.